Spending my fall hunting for waterfowl and upland birds always leads to my shotguns being plugged full of corn stalks and loose marsh grass. After each hunt, I try and clean my gun out to ensure it works properly on my next hunt. I’ve spent way too many years cleaning my gun bore with gun cleaning rods. However, with the number of days I hunt, I don’t always have the time to deep clean my gun with a cleaning rod. Therefore thanks to a good friend who showed me how quickly he cleans his gun after each use with a bore snake. After buying quite a few different brands over the years. I’ve been able to compare the different bore snakes and write the best bore snake kit reviews post. Bore snakes give you the ability to very effectively clean your gun after each use. Therefore we’ve picked out the top five bore snake brands to see how they compare against each other. Real Avid originated out of Minneapolis Minnesota with a goal to modernize the way gun enthusiasts clean their guns and equipment. They offer a comprehensive amount of products. 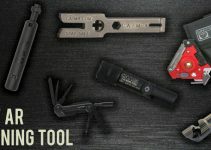 Even though we are only reviewing their boresnakes they have a full line of tools, gun maintenance and cleaning supplies for shotguns, rifles, pistols, and AR-15s. Even though Real Avid hasn’t been around for more than a few years, they have quickly supplied their customers with plenty of products. If you are looking for cleaning mats for your AR-15 or a how-to-guide for your Glock look no further than Real Avid. 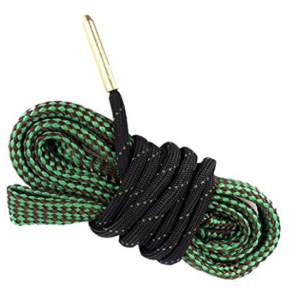 The Shotgun Bore Snake is offered with a 32″ long cable for pulling it through your barrel. 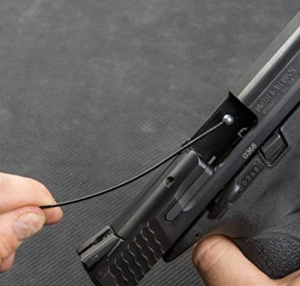 Each cable is a steel cable coated with a soft rubber to ensure it never scratches your gun when using. The cable is fixed with a solid ball end that fixes to the pull handle that doubles as the storage device. Real Avid hit it out of the park with this design. Not only does it come with a storage container for the bore snake but it also works to pull the snake through the gun barrel. Most of the other brands simply just roll up and don’t include a storage container. 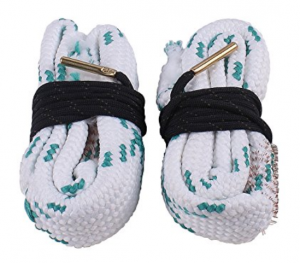 The bore snake has an awesome storage and handle design, unlike any other brand. I explain that more in the next paragraph. As for the mop and brush design, they are connected to the cable making it a one-piece design. So with its storage container and one-piece design, it makes it easy to throw in your hunting bag. Real Avid offers both 20ga and 12ga bore snakes. 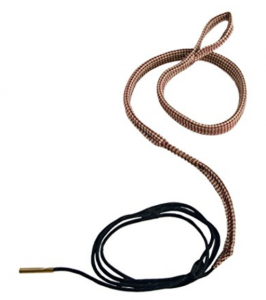 The Rifle Bore Snake is offered with a 32″ long cable similar to the shotgun bore boss. The Rifle Bore Snake is offered in sizes .308, 22cal, .270cal, and many more. 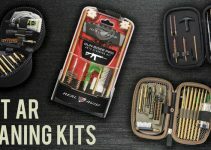 They make some of the best AR-15 cleaning and maintenance kits. The bore snake is a single piece design integrated with phosphor bronze brush and a braided mop. Therefore cleaning the barrel in one swift pull. Hence saving you time versus the conventional cleaning rod style kits. As for value on the rifle style bore boss, Real Avid has a very affordable price point. 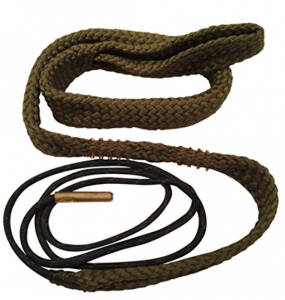 Real Avid’s pistol bore snake is offered with a 12″ long cable attached with an 8.5″ braided mop. So no matter what type of handgun you have whether it’s a 1911, revolver, or striker-fire. You are able to clean your pistol barrel quickly. 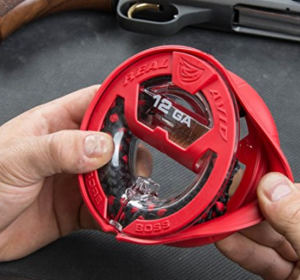 Thanks to Real Avid for thinking their design through and no matter if it’s a rifle, shotgun or pistol the same storage and handle design applies. So if you have multiple caliber guns you just need to purchase the right size bore snake. Thankfully they are well labeled. 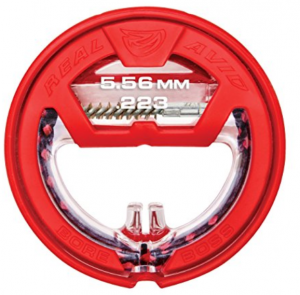 Real Avid offers multiple sized handgun sizes, 9mm, .44cal, and .40cal. Hoppe’s has been around for over 100 years and easily known as the top gun cleaning company around. Currently owned by Vista Outdoor Brands which headquarters out of Utah. Hoppe’s makes some of the top of line lubricants and oils. They have a product line up that satisfies the weekend warrior through the avid big game hunter. With oil and lubricants that are designed to withstand a wide range of temps from -65°F to 540°F. They truly supply a wide range of customers. With 100 plus years in business, you can expect that oil and lubricants aren’t the only things they are known for. Which is why they have created not only every gun cleaning kit you could ever need, but also every bore snake. Offering multiple styles and calibers to fit anyone’s price point. The cord is designed to be dropped into your shotgun barrel. The end is fixed with a weighted brass end that you drop down the tube and pull through the barrel. Thankfully the cable is a softer nylon make, which makes it quite easy to use with the brass weighted end. As for the floss path, it is fixed with embedded brass brushes that brush the inside surface of your barrel. I really like how the Hoppe’s boresnake has a floss path before the brass brushes to loosen up gunpowder before the scrubber runs through the barrel. 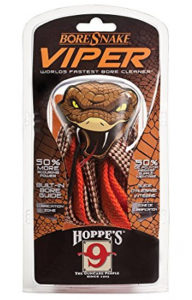 Hoppe’s also has designed a bore snake that is washable to be reused over and over. 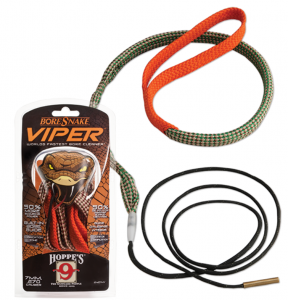 Thanks to Hoppe’s being around for 100 years they have almost every size shotgun bore snake available: .410cal, 20ga, and 12ga. Similar to the shotgun style bore snake the rifle bore snake is fixed with a brass end cable and a floss path make it a one-piece design. Each Viper bore snake has 50% more brush cleaning power than their traditional bore snake. However, thankfully you can still machine wash each one. Which is really nice because after 20-30 uses it can get pretty black and oily. A quick wash and I restored mine to look like brand new. Rifle product select is pretty deep: .225cal, .244cal, .280cal, and everything inbetween to .50cal. I use this on my Glock 9mm, and this one works really well. Thankfully my Glock breaks apart really quickly. However, know with the pistol bore snake it takes seconds to run it through the gun if you don’t want to disassemble your gun. Similar design as both the rifle and shotgun bore snakes. Offered in multiple pistols and revolver caliber sizes. Sage & Braker is run by Fred Bohm an avid hunter and firearm enthusiast. He created this company with the purpose of getting to work on a passion of his. Thanks to him this small business has been able to thrive in selling great bore snakes for various size firearms. Sage & Braker has a very special mission they pledge to donate 1% of their sales is donated to support preservations and wildlife. So if you are interested in a not only a great product but company as well, you will be pleased to go with Sage and Braker. Sage & Baker has such a unique design. When I bought this one I had no idea that you can actually change out the brush on the bore snake with other brushes. It’s flawless, surprised some of the other larger big brands hadn’t thought of this style. As for the cable and end, it’s very similar to the Hoppe’s nylon and brass design. Nothing special, but it works like a charm every time I use it. Sage & Baker offers multiple rifle caliber sizes their .223 is one of their more popular ones. So looking at Amazon reviews which have nearly 2000 reviews most of them seem to be 5 stars and their customers are pleased with their purchase. Thanks to their design the 9mm bore snake can be used on both .38 and .357cal guns. I only was able to use it on my 9mm, but it worked fantastically and I really liked how I can change out the brush. Don’t be afraid to buy a couple of these for your guns because they work perfect and are one of the quickest ways to clean your pistols. Plus they have a 100% money back policy if you don’t like the results. Unigear is an outdoor company that has their hands in pretty much everything. So if you are camping, hiking, hunting or spending any time in the outdoors they probably have gear for you. They tend to have the cheapest price point compared to the rest of the bore snake manufactures. I haven’t had these for as long as the others. So I haven’t been able to put this to the test to see how durable or check their lifespan. However, so far they seem great for the price point. 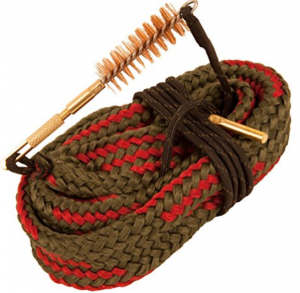 Unigear’s shotgun bore snake designed their mop to have the brush embedded into it. Still offering a single piece design that works very similar to the Hoppe’s bore snake. Offered in both 12ga and 20ga. The Rifle Bore Snake brushes and swabs in one quick pull. I usually have to run this one twice through the barrel. On the first pass, you can see a few particles of debris. Therefore I run it a second time and it seems to clean it right up. Unigear offers a lot of rifle caliber sizes. Plus they offer two packs that are discounted versus buying two separately. Similar to both the shotgun and Rifle Bore Snakes they offer multiple pistols and revolver caliber kits. The one thing I see with the pistol bore snake is that they don’t have a heavy set brass brush. They have a few bristles built into the mop. However, they may wear out pretty quick and not get a deep enough clean. If you have multiple pistols, however, Unigear is the way to go because of how cheap these are. You can easily purchase a few of these without busting your budget. Ultimate Rifle Build is a newer company that offers multiple parts and builds for AR-15’s and rifles. They don’t seem to specialize in gun bore snakes. However, for the price, they are very affordable and offer a 1-year warranty on all of their products. So even if one of the brass ends breaks off or breaks down you can get them replaced before a year. I found the Ultimate Bore Cleaner to be nearly the same as the Unigear Bore Snake. I would recommend if you have a budget or you want to keep one of these in your truck or blind bag. This is the one to buy for that. They are inexpensive and pack up small. Plus if you lose one they won’t break the bank. As you can imagine the rifle bore snake works very similar to the other brands. Designed with the same brass end and nylon cord with embedded brass brushes. The only draw I see with Ultimate is that they seem to not have every bore size needed. However, for the price you can’t go wrong. 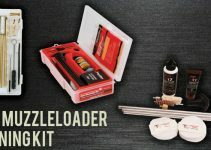 Ultimate Rifle Build pistol cleaners offer multiple pistol kits as do the other brands. Similar to the Unigear pistol kits I wish the brass bristles were more aggressive when cleaning. Therefore this would help prevent having to run the cable through more than once. Ensure that your gun chamber is empty of all shells and rounds. This way you know your gun is safe to work on. Ensure your safety is on if your gun has one. Grab some bore cleaner I use Hoppe’s cleaner. Its foaming action works really well. Next, I spray the foam cleaner down my gun bore about a good 3-5 second spray. Let is sit a few seconds and move to Step 3. No matter what bore snake you decide on purchasing after looking at The Best Bore Snake Kit Reviews post. You won’t be disappointed, they all seem to work very similarly. Run the lead end or brass end of the cord into your gun chamber and running it towards the end of the barrel. Once the lead end come to the end of your barrel pull firmly ensuring that the mop and brass brush are entering the bore without scratching the outer surface of your gun. Usually, one pass does the trick. However, if you are like me and want to make sure you do a top-notch job I run in through one more time. If you know how to break apart your gun and want to do a more thorough job I recommend removing your gun barrel. This way you can get a more clear view of your bore. However, following steps 1-3 is the easiest way to clean your gun with a bore snake and it can even be done out in the field. I tend to use mine after a hunt knowing I’ll be hunting the following day. This way I ensure I start the hunt with a clean bore and prevent any issues. Why Use a Bore Snake? Bore Snakes are a quick and effective means of cleaning your gun bore. However, they are not an alternative or replacement for deep cleaning your gun. I typically use my bore kit after each hunt or range shoot. However, every 2-3 weeks I make sure I get out my cleaning kit and do a proper cleaning of my guns. Especially knowing how much abuse my shotguns go through after hunting ducks and geese. I’ve broken down my shotguns to find nearly an entire corn stalk built up in my gun. A deep clean with a good cleaning rod kit and a full break down to clean and oil your guns is important. Hence when I know my guns will be in storage for some time that is when I swap the bore snake out for the good old cleaning kit and make sure I do a thorough job. So if you are unsure of what type of solvent and oil to use with your bore snake check out our Top 10 Best Gun Cleaning Solvents here. Guns Cleaner Copyright © 2019.